The 21-year-old phenom and NL Rookie of the Year frontrunner Jose Fernandez took the mound for the final time this season on Wednesday night. The Marlins urged their fans to come out and see the young ace take on the Braves at Marlins Park, and the fans got much more than they bargained for. In the top of the sixth inning, Evan Gattis led off with a monster home run into the left field seats. He took his time out of the box, watching the blast, which was the only run Atlanta scored on Fernandez for the night. Two batters later, Chris Johnson hit a laser to left field that was caught by Christian Yelich. When Johnson started back to the dugout, he said something to Fernandez. The pitcher clearly took offense, yelling back at Johnson. After the inning, Fernandez showed his emotion in the dugout and was fired up about the events of the previous inning. Chris Johnson charged in from third base to confront the pitcher, an action that caused the entire Braves team to jump up and join the debate at the plate. The Marlins’ dugout emptied and the bullpens followed suit. Even before everyone arrived at the confrontation, Fernandez was back in the dugout steaming off. Placido Polanco then restrained Chris Johnson, who was still mouthing off. No punches were thrown nor ejections issued. It was just an average Atlanta Braves game. After the conclusion of the matchup, which Miami won 5-2, Fernandez apologized for his actions and explained his conversation with McCann. 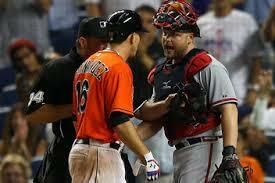 Fernandez said that he and McCann have a close relationship, and that this exchange was nothing to be concerned about. It was not until Johnson charged in that the situation got out of hand. The fact that Fernandez was able to confess to his mistake of admiring the blast is itself admirable. Jose has always been an emotional player on the field, and frequently is visibly fired-up after certain plays. No one, until last night, had taken exception to that. Chris Johnson said after the game that the Braves dugout was unhappy about Fernandez “smiling after getting people out and all that kind of stuff.” Smiling? Excuse Fernandez for being excited to pitch in the big leagues and winning like an ace, but not every pitcher will have a complete poker face when he’s on the mound. Many analysts assumed it was Fernandez spitting on the ground by third base that set Johnson off, but no one emphasized that in the post-game comments. The Braves are leading the NL East by 11 games. And they have some serious issues if they cannot handle a rookie pitcher being excited at the conclusion of his spectacular season, or if they take offense to a team trying to defend its own players and dignity. For Atlanta, the season from here on out will only become more intense, more emotional, and more personal. Enough said. Jose Fernandez finished his inaugural year with a superb 12-6 record, 2.19 ERA, and 187 strikeouts. The book on Fernandez’s rookie season is officially closed, but the 2013 chapter of Spat-lanta continues. Great season by Fernandez. Incredible immaturity by the Braves, especially Johnson. Who died and made the Braves the baseball police. They need shut up, check the attitude and play baseball. I hope Freddie can control those guys, because sometimes they look like they are out of control.